Winners will be published in Overland 230, autumn 2018. The award is open to poets who have had no more than one solo collection of their work commercially published: that is, by a publishing house with commercial distribution. 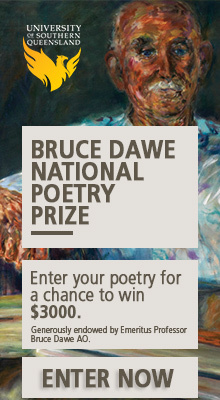 The prize is open to Australian and international writers. The winning poems will be published in Overland. An entry fee of $12 for Overland subscribers and $20 for non-subscribers will be charged. It is possible to become a subscriber and simultaneously enter the competition at a special price of $56. Please ensure you are satisfied with your poem before submitting. Poems that are withdrawn and subsequently resubmitted will incur a second fee. The competition closes 11.59pm, Sunday 19 November 2017. Overland staff and board members, and their families, are prohibited from entering. All previous, current and ongoing contributors are eligible to enter. Winners will be announced in February 2018. Subscribe to the Overland email bulletin to receive announcements as to the results. Enter the 2017 Overland Judith Wright Poetry Prize.